You don’t need a yard, or even any gardening skills to grow your own food at home; you just need one of these countertop AeroGardens. These fully-integrated, soil-free indoor gardens can grow herbs, vegetables, and salad greens up to five times faster than regular soil. Normally priced over $250, today’s price of $168 is the best we’ve ever seen. To start growing you simply pop in the seed pods, pour in some water, occasionally add nutrients, and the machine does the rest. 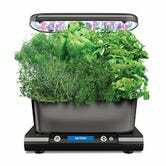 This AeroGarden has accommodations for nine plants and includes seed pods to get you started. So start growing your own garden, or gift to an aspiring green thumb.